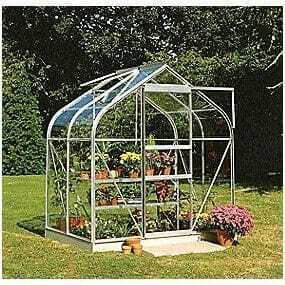 The Halls Greenhouses Silver Aluminium Magnum Greenhouse is a uniquely designed structure that will provide a stylish and practical feature for your garden. With a few optional extras to choose from, you can customise the greenhouse to your specific requirements. You might also like to see the top 20 glass greenhouse currently on sale in the UK by visiting the WhatShed glass greenhouse awards league table. 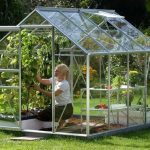 This average size greenhouse is great for growing many different types of plants, flowers and vegetables and comes in toughened glass glazing. Additionally, you are able to buy an optional auto vent to control variations in temperature. A great choice for any gardener as it is low maintenance and comes with a 15 year guarantee plus its handsome looks means that it will be at home in any garden. The smaller 4x6ft size of this particular model means that it would be ideal for the smaller garden or as an additional greenhouse for those requiring more growing room! With the addition of one or maybe two multi-level shelving units or potting benches, you will find that you have the space to grow a variety of flowers, plants and vegetables. 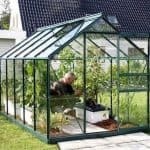 If you are actively looking for a greenhouse you will no doubt be aware of just how many different types of greenhouse are out there on the market today. 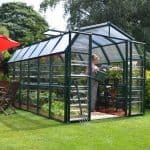 Sure, they all do the same thing, but with many different sizes, designs, and many optional extras to consider, we thought you may appreciate a little help in finding the best greenhouse for your needs. In this section we have a more detailed look at the Halls Greenhouses Magnum greenhouse, discuss its advantages and disadvantages, and see how it could fit into your gardening lifestyle. Exterior: The greenhouse exterior has a stunning unique design with curves that are rarely seen in greenhouse designs. This particular model is constructed from a strong aluminium frame and toughened glass panels that will keep out the elements and provide the ultimate growing environment for your projects. Interior: At 4x6ft, the greenhouse interior is at the smaller end of the range for greenhouses however it is ideal for smaller gardens or those with a smaller collection of flowers and plants to grow. The space will allow for a potting bench to be placed on one of the sides, whilst still leaving a galley walkway for accessibility. Door: Despite the leaning roof design, the doorway is full size, ensuring that you will not bump your head upon entering or exiting the greenhouse. 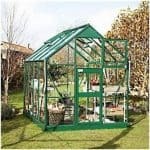 The door is a good size in relation to the size of the greenhouse and will allow you to access your items easily. 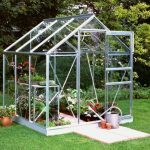 Halls Greenhouses Silver Aluminium Short Pane Magnum Greenhouse: How easy to build? The Silver Aluminium Magnum Greenhouse has a unique design but nonetheless its assembly process is as straight-forward as a regular shaped greenhouse. Due to its predominantly glass construction it is recommended that two people work on assembly together, due to the weight and delicate nature of the glass, as well as for safety reasons. The instruction manual comes in a variety of languages for accessibility for all and contains a clear step-by-step guide as well as easy-to-follow diagrams. A basic tool set will be required for assembly, however all of the glass panels, framing, fixtures and fittings will be provided. Halls Greenhouses Silver Aluminium Short Pane Magnum Greenhouse: What is the overall quality like? Halls Greenhouses offer a wide range of greenhouses with a variety of sizes, features and optional extras available. The Silver Aluminium Magnum Greenhouse is a wonderful example of style matched with practicality to deliver a greenhouse that is a great all-rounder. With floor to ceiling toughened glass panels, held in a solid structure by a strong silver aluminium frame, the gardening projects inside are protected from the elements whilst being able to flourish in the perfect growing environment. The greenhouse is very low maintenance, only requiring a clean if necessary. Cleaning the greenhouse is simple with just a hose down with water and maybe a soapy solution for the glazing to keep it sparkling. The Halls Greenhouses Silver Aluminium Magnum greenhouse will provide the ultimate growing environment for your flowers, plants and vegetables. Enjoy a 360 degree view with floor to ceiling glass out to your garden whilst tending to your latest gardening projects. 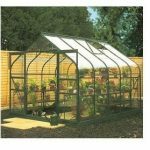 With a 15 year guarantee and priced at a lower mid-range price point for greenhouses of this type and size, you can’t go wrong with this stylish addition to your garden.